The social revolutionary thinker, writer, ecologist, environmental activist and founder of Planet Drum Foundation died on July 28, 2011 after a sudden case of pneumonia complicated by his bout with lung cancer. Peter Berg was an unforgettable personality for anyone who made his acquaintance over the past several decades. This blog will be where we collect remembrances, reminiscences, recollections, tributes, rants, soliloquies, orations, and simple thank-you’s for a man who touched many lives. A light just went out in my soul. it is only by chance that I learned of Peter’s passing when, with nothing to do, i decided to Google Planet Drum and found this page. There is nothing much a one-time best friend can add to the eloquent recollections and tributes that precede this frail and tardy contribution. Peter and me were a two-man ‘gang’ in Miami between 1952 and 1955, he a year younger than I but a year ahead in college. We discovered smoking, Jack Kerouac and peyote together. I was in awe of his genius and knew in my bones that he would go on to leave an indelible mark in whatever world he would create. In that he obviously succeeded. We spoke or exchanged notes no more than three or four times in the intervening years but — while we grew worlds apart — our relationship has remained the warmest of all my memories. Good bye old friend and thanks for the profound influence you were on my life. 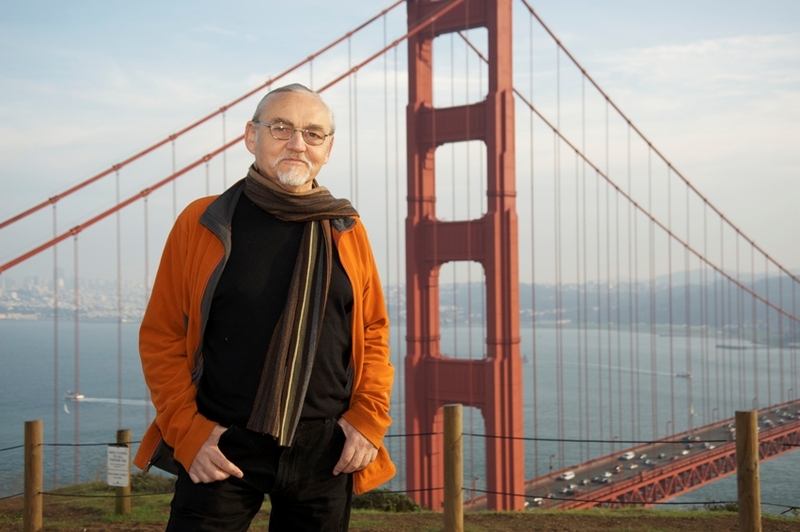 I can only say that I had the privilege of taking Peter’s last stroll in his beloved San Francisco. The San Francisco streets he so deeply loved and intensely shared with anyone coming into town. He took me to a morning coffee cup and walk in the Misssion District that was so beloved to him. We then strolled a couple of blocks and asked me to let him sit down to rest for a while and to take a walk while he gathered up a bit of energy to continue. I left him sitting and took a few snapshots of the streets and shops nearby. A few minutes later I went back to him and returned home. On the way back he told me how marvelous it was showing me the alleys full of graffiti and how great it was to discover new things with me. The surprises he lived whenever we were together. This is something I had never heard from anyone before and will cherrish it as long as I live. Gracias mi querido amigo. Te encontraré y seguiremos la fiesta de la vida! Ayer mi corazon se sintio muy triste al enterarme de la noticia del fallecimiento del ecologista Peter Berg hombre que luchó y se entregó a la ecologia . Peter era un activista ecologista de mente clara, apasionado, visionario, que analizaba todos los aspectos de la interacción entre las especias humanas y no humanas y transformaba sus ideas en acciones. en mi corazon y en mi mente siempre estaras por que gracias a ti hoi m apasiona l medio ambientee grcias a ti sigo esa carrera en la universidad amigo mio grcias eternmnt grcias x ser esa persona tan maravillosa que m alento a ser mass en esta vida. que fuiste tú quien desperto en mi un amor por la ecologia y el medio ambientee como tambien el resto de chicos que conforman planet. mis mas sentidas condolencias a sus familiares y a Planet Drum que pierde un valiso Hombre Desacnza en Paz amigoo q Dios lo tenga en su santa gloria. When I had a moment alone with Peter and Judy, I asked how they WERE. Judy said simply that they were spending a lot of time grieving together. Peter – in his Peter-way – groped to find the words that would perfectly capture the awfulness of a terminal diagnosis. He said: “This THING [–he never wanted to grace the “LC” (lung cancer) with a name–]. This thing makes my daughter cry. It makes my son-in-law distraught.” For him, I don’t think there was a greater indictment. On that same visit, Peter told me a story about a trip that he and his family took long ago to the Russian River or Petrolia. Peter and Ocean, who was then no more than 3 years old, went on a swim together. With Ocean in the lead, the two of them discovered a beach. Peter described this experience of discovering nature’s beauty with his daughter as… perfect…utterly wondrous. When they returned from the swim, Peter said his first impulse was to tell Judy about the experience because, up until that point he said that he always thought of “the family thing” as Judy’s thing. It was something that Peter initially did out of his love for her… not for himself. But he realized on the swim back that somehow “the family thing” had become his thing, too. And that he didn’t need to report this miraculously moment to Judy. It was enough to have lived it. He concluded this story by saying that “from that point on, me and Ocean were like this” (with fingers crossed). If I can digress a moment, when I was at school , there was one class that affected me at a soul level. It was a course on Native American mythology. We learned about Origin Myths. It seems to me that all Origin Myths share a common attribute, which is that they describe the moment when a community of people awaken to a shared destiny and identity. And that moment in time is always tied to the land in ways that are metaphorical, spiritual, and profound. For instance, the plains Indians lived, for a long time, in the Rocky Mountains as a nomadic tribe. One of their storytellers describes their experience when they went East, and first glance the great plains. The storyteller described it something like this: “…we turned a corner on the slope and glanced a majestic landscape so clear and expansive that you could make out the smallest detail, like a herd of buffalo. “ Well, if a herd of buffalo is a “small detail,” you can be pretty sure that that landscape encompassing it is unfathomably expansive. And because of that experience of nature, those people who had – up to that point – been mountain people, they became and defined themselves as The Plains Indians. In other words, they embraced that momentary revelation and experience of wonder in nature, and let it define them as a people and community…for many generations to come. Back to Peter and Ocean’s swim: I thought of Peter’s story as his own Origin Myth – the Story of How Peter Became a Father. And I think he thought of it that way, too. I think that’s why he shared it in that moment of brutal confrontation with his own mortality. So moving forward to the recent past… Peter was never the sort of grandfather who bragged gratuitously about his grandchildren. Sure, he commented on how innately and effortlessly cool Stelli is, but he didn’t drive around with a “my-grandchild-is-an-honor-student-at…” bumper sticker on his Prius, or make his friends admire photos of family vacations…with a singular exception. After Peter, Judy, Ocean, Mark and the girls went to Ecuador, Peter did ask Martin and Adrian and I to look at photos. In particular, he wanted to share pictures of a wondrous boat ride that the 6 of them took through the rain forests near Bahia. And he described the moment when Flo spotted a bunch of birds or monkeys, and his own unfettered pleasure at partaking in that moment of wonder with her…in much the same way that he described that long-ago swim with Ocean. Another thing Peter once described for me was how one goes about restoring an ecosystem. And as we know from his revegitation work in Ecuador, you don’t just go in and plant a forest. Rather, you first plant the grass, which anchors down the top soil. Then you plant the shrubs that shade and protect that grass. And once all that and more is in place, only then can you plant the trees that grow into a majestic forest. Judy, Ocean, Mark and the girls – Peter’s family – they are certainly each a forest unto themselves. They’re also the ecosystem that anchored Peter, protected him, nourished and inspired him, and enabled his magnificence to come to be. What I’m trying to say is this: We are joined with you – Peter’s family – in a common effort …not to remember Peter (that’s easy and self-evident). But rather to recognize Peter’s magnificent spirit in those moments of perfect wonder and awe at the beauty of the natural world around us. Sorry to hear of Peter’s passing. I had already intended to move to San Francisco, and after landing a job as a pressman in a downtown print shop, I looked up Peter and Judy and was invited to dinner, where Peter enlisted me to help in the production of a bundle; there followed many post-midnight hours in the print shop, whose friendly owner had given me a key to come and go as I wished. As I worked the press, and others did the collating, stapling, etc,, we emptied bottles of Rainer Ale while listening to Peter’s engrossing tales of early Digger exploits, featuring the antics of Emmet Grogan, Peter Coyote and many others. I introduced Peter to my playwright friend John Robinson, several of whose works had been produced at San Francisco’s “Magic Theater”. In Sacramento, legislation was being prepared to authorize the building of a Peripheral Canal that would drain water from near-pristine, un-dammed Northern California rivers to Los Angeles, by-passing the Sacramento Delta. It was an ideal issue for the nascent bio-regional movement to take on. John was inspired by Peter to write “Thirsty”, a one-act play that I helped produce, Tom Usher directed, and featured actor-singer-comedian Jane Dornacker, Kent Minault, and other street-theater activists. We performed the hilarious put-down of LA culture and corrupt state politics on the lawn of the state capital building, at Union Square, and other key venues, garnering extensive local and national press and TV coverage. We were a significant factor in the legislation being defeated. Just an example of one of the many successful actions initiated or inspired my Peter Berg. Twelve years ago I moved to Willits in Mendocino County, where bio-regionalism has almost become a religion among the politically active. When talking with young eco-activists, I am often nonplussed when I ask if they have been influenced by Peter Berg, and most say they have never heard of him. Little do they know, they have been greatly influenced!! Thanks, Judy, for inviting me to dinner that night and for the many wonderful memories I have of what followed. Here are some of the watershed moments I had with Peter, whom I encountered when I was young and impressionable. >>Arnie Passman hosted his House of Cards and told me I’d like this guy, Peter Berg, “He’s a raver.” Peter asked us to close our eyes, raise our fists and point our thumbs North. Few got it right but the point was made. Understand where you live. >>Back then, he was twice my age and provided me a living link (my ceolacanth) to what I felt I’d missed: Diggers, Flower Children and the like. >>In the early 80’s Peter predicted that in 10 years acorn meal would be offered for sale as a product. I’ve still not seen that happen. >>While performing some pro bono handyman services on the office I found myself on an aluminum ladder bolting the live electrical service back to the building. Meanwhile, below, Peter watching, told me the funniest, dirtiest joke I can recall. He was ahead of his time and behind the times, when green meant money and local meant a phone call. Where ever you live, his ideas have spread, improving your burg. Thanks for the memories, Peter. Peter Berg, Planet Drum Foundation Director for the last 40 years has left us and has passed to another realm. The beat of the Bioregional Drummer that he personified over all these years inspired many people in North America and across the Planet. Planet Drum’s beat will go on and it will be heard and amplified by all those people that he has touched in his life. His premature death has saddened us in a very personal and intimate way, while we are trying to keep the Bioregional Thought alive. His call in 1979 “Amble towards Continental Congress” resonated from San Francisco to the Ozarks, from the Frazer River Valley in British Columbia to the Anahuac Highlands in Mexico, back to the Tall Grass Prairies of the Heartland and over to the Po River Valley in Italy. The Ten Continental Bioregional Congresses that convened since that call, as well as many local Bioregional Gatherings and Watershed Councils all over the Land are one of the testimonies, among many, to his enduring legacy. In these trying times and without Peter’s presence and encouragement, it will be harder for us to continue the work of nourishing the Bioregional flame. But we will work harder carrying the inspiration of his visionary activism, his ever clear analysis of the interaction between human beings and all the other beings, his writings on living in Place in his “Bundles”, on re-inhabitation and restoration of degraded Bioregions while at the same time taking care of basic human needs. These thoughts are points of resistance opening spaces against the pervasive homogenization of human cultures by the march of globalization. We will remember Peter dearly, be guided by his spirit and will encounter him every time we thank the Earth, pray to the Sky, honor the Four Directions and call out to all our relations…. Coco Gordon , Mary Meyer, Maria Martinez-Ros, Leonor Fuguet, Caryn Mirriam-Goldberg, Blake Angelo, Trent Rhode, Richard Gustafson, Ken Lassman, Chant Thomas, Lenel deEmma, J.T. Rehbock. shaken over the sudden, unexpected movin’ on of one of our exceptionals–honored all over the bay–from berkeley’s watershed poetry festival to his san francisco memorial. what a soul we had in peter, in the spanish understanding of duende, beyond the muse or angel, that which seizes all–awe? a poet pioneer in the unconscious (?) leader of the world sense–we hope. who knew there were pioneers in the late 20th century. well, we know now. mythological in the best, the only sense. i knew peter from the very earliest mime troupe shows–’64,’65. they took over my heart. went with peter in ’76 to humboldt county, where he introduced me to john ross in that arcata bar, met native leader charlie thom, rode through those mountains collecting tales of reinhabitation, eating crab in mountain light, returning for a spring equinox on san bruno mountain. and to think he jumped off a lumber freight from portland here in 1962, and ended up wintering at a sustainable community in ecuador. Our Berg has joined where all storms are fervorformed. Sorry I’ve been out of touch. Peter’s passing is just about now starting to sink in. I’m not much for looking back, but this has forced me, and I think for the good. I realize now that Peter was one of only two people I’ve accepted as moral and intellectual equals. We could talk. I know a statement like that is blatant ego run rampant, but it’s a just now realized statement of fact. It’s interesting that your contact with Peter starts when mine became long-distance at best. And I think it’s clear to both of us that we knew one and the same person. Ah, he was a story teller. That last time we saw you, in upstate NY, when you were traveling in that gloriously clapped-out old Chevy truck and we spent a great day up on Highmount, Peter had apparently just read an account of Sukhbaatar, the more-or-less father of Outer Mongolia as we know it. He told a long and continuous story about this man, who through my ears became Suki Bator. There was another couple with us, March Avery and Philip Cavanaugh. We all had a fine time, mostly because of Peter’s long story. Do you remember this? Anyhow, Philip, a droll and dry English professor, later asked me “WHO was that man?” and rambled on and on about how this man was the best natural story teller he’d ever.. etc., etc., And he was right. And that’s only one Peter-story of so very many. I’ve been trying to put together a plan to get out there for Oct. 1, but it’s just not going to work. I’ll try to get to the one here. And I do plan to get out there. movement that was taking place. (1969-1971). lived in Indonesia for seventeen of them. all you and Peter have given me. I will miss Peter the Pirate. improved world offer some comfort and solace. from Alaska to South America. harvested along the ocean’s shore. I only found out about the passing of our galaxy Peter day before yesterday. One of those passings that feels more than just about a single person. Larger than life as you know. And hard to imagine a Judy with a Peter or the other way around. I thought of Peter many more times than I saw him. God when did we meet? I know you both were at my home when I lived with Nancy who died of cancer in 1984. I think that would have been then about 1980. But long before that I remember stumbling around in my head and dialogue with others about the importance of place but something I just couldn’t quite get my head around until I heard from the Mussel Beach group, and a woman with a longish Indian name, who told me I needed to meet Peter. Peter’s work has been a cornerstone of my intellectual, creative and activist life. I was inspired to have my friend, Bob Benson make a map of the Ecotopia bioregion, the first of our region and one of the earliest bioregional maps. I saw Peter many places but for sure the most exciting and exotic was Bahia. After all those hours getting there and I’m standing in a hotel lobby and Peter comes walking out down the hallway with his hair wet. Walks up and gives me a hug. I’m thinking what the hell (mystified not indigent) is he doing in our hotel taking a shower? He explains hotel is owned by local sponsor of the eco project. He gave me a hug and I remembered thinking then how he gave good hugs. I will miss him! But you know he left his mark, he helped many people, he populated the planet with wisdom and laughter and good work. what a splendid legacy. If you ever come through Portland you know you have a place to stay. In the six weeks since Peter’s death, grieving has come with reflection. meet you for the first time. Thank you for your communication re. Peter’s passing and Celebration of his life on Oct. 1. I have many fond memories of Peter, the Free Store, the Diggers, and working the Free Medical Clinic. One evening, while I was at the Clinic, Peter grabbed my hand pulling me upstairs as he “had something to show” me. Next thing I knew, I was walking on a large American Flag draped over the stairs! Mind blowing experience – Peter was great at experiential theater. Sue and I are appreciative of the leadership and creativity Peter and you provided to that glorious time. We are both sad about his passing, and regret we will not be able to attend the Celebration. flag with huge watermelon stars & shared it for dessert with the group Peter had welcomed to do our walk through the geology of the region, bared & showing its age & part of a day to learn how do Bioregional mapping. Peter instructed us, all ages, and every map personal from the heart of each one’s place. our entry to much of the Commons during his lifetime. punches & instructions: “for seasonal use. Results may be obtained through traditional means, or by desired preparations such as affixing to walls. (& in italics) “Outcomes vary according to location”. I still have the t-shirt I silkscreened at the 1991 Shasta SBG [Shasta Bioregional Gathering], doing the fun hook up with someone I didn’t know, driving up there, I can still feel the hot day sun comraderie. & am very happy I subscribed for so many years to Raise the Stakes, then to the Pulse publications. I have that David McCloskey gorgeously drawn Cascadia map and all those intimate Bioregional Directories. Remembering Peter’s, “Starting Over Without Columbus” makes me feel it’s time to take out all those publications and reprint voluminously, — as that 20 years-to-forget syndrome demands a wide repeat of such reportage as Decolonizing the Language of the Ecology Movement” and Freeman House’s, “What are the Salmon Telling Us?”. You know that needing to reinvent the wheel cycle of two generations? “we are invited to go beyond making a living to living a making”. Thanks for all of you, especially you, David El H, Charlene Suggs and Alice Kidd leading me in to express at least some of my key Peter Berg-times to memorialize. Hugs to you Judy and Ocean, may you carry forth, basking in the light and love of your magical Berg lives! For keeping us in the loop & forwarding word of Peter Berg’s passing. I had heard from Robert Young here in Eugene that Peter was suffering from lung cancer, but such a death as he still took me by surprise. The eulogy from Planet Drum was wonderfully evocative. I have only a few comments to add. First, what struck me most when meeting Peter the first few times was his audacity, his grinning energy, his courage in taking a unique stand, and his clarity & amp; conviction of thought. Wow, when he launched into those critiques of global industrial monoculture and the bioregion as the place to decentralize to, “the elsewhere of civilization,” I sat up and listened hard–he got me right away. Of course, I loved his “mapping your bioregion” workshops with the Luminous Judy Goldhaft & amp; her tremendous “Water Web” dance. It inspired me to begin working on mapping Ish River Sound & Cascadia. He was also a much better writer than people recognize…. One minor correction: to my knowledge Peter was not the first to coin the term “bioregion,” that honor goes to the obscure inventor Alan VanNewkirk of Canada. Peter may have been the first to coin the term “reinhabitation,” although I don’t know who invented what in that fruitful collaboration w/ Ray Dasmann. But there’s something else still, a little harder to put one’s finger on. How & why & when did Peter Berg have the epiphany, the felt transformational insight, that the existential key is PLACE!!??? Not abstractions like Environment nor Ecology, nor –nor–or etc., but the living breathing place? Peter felt in his bones that the “earth is alive,” and the face of the earth that we inhabit is the place itself–the life-place. Perhaps it was a translation of the ecological notion of habitat, or some other source, but opening himself to the reveal of this fundamental truth transformed his life and ours. Today we need to recover both the notion of reinhabitation and bioregion from an overly localized notion of life-place and embrace our wider regions as living places, such as Cascadia…. I stand in tribute and do a waterfall dance for Peter Berg, Freeman House, David Simpson, Stephanie Mills, and the other pioneers of bioregionalism! I learned of Peter’s passing as I prepared for a Goddard residency in Vermont. Landing in a bioregionally-oriented community like Goddard gave me a place to feel and express much, especially during Dr. Susan Pearson’s “Awakening to the Ancestral Stories” gathering. We met in the labyrinth garden on a summer’s eve that was so wind-swept that even the sheltered candles refused to stay lit. But the darkness of the circle made the stars more radiant, and the stories and tributes that flowed, more magical. I recall saying that I’d just lost “my intellectual father” and immediately thought that Peter would bristle at that comment. By the numbers, he was hardly old enough to be a father to me, and I was also remembering a puzzling event from long ago. Others may be able to recall the year; it was one of our earlier congresses, and the one in which we first honored our elders by asking them to come to the center of our circle. We defined elders as those over 50 years old, but Peter refused to join them. Although we never spoke about this, my sense was that he was an ageless being. “How old would you be if you didn’t know how old you are?” Peter seemed forever young. I left the Ozarks that year, the degree program I’d begun at Southwest Missouri State University in psychology, and my intention to go “back to the land” soon after meeting Peter and Judy at the OACC/NABC I. I was awestruck by their art and their work, and my plan was to have an extended visit with my grandparents in the desert southwest, and to eventually re-locate to the Bay Area to continue my studies. I wanted to offer myself to Planet Drum as a volunteer. It became clear, soon after I arrived in Scottsdale, that my grandparents needed me there; it would be a seven year stint in the Sonoran lands, and lead to my work in the design of cities and developing the Minds for History programs with Paolo Soleri and the Cosanti Foundation. By then, Peter was diligently writing about and building the green cities initiatives, and Janice Perlman had begun her work to identify megacities and the impending crises she foresaw in places like Rio de Janeiro, Beijing, Calcutta, and other urban centers with inadequate infrastructure and carrying capacity for their ever-increasing populations. As a product of big cities, I felt a true calling to the work of urban adaptation, and Peter’s work helped infuse the daunting tasks with hopefulness, and humor. He was eventually honored as a “Mind for History,” sharing a stage with Nobel laureates and esteemed scholars for a full week at Arcosanti, and delivering a stellar series of talks and discussions. There along the Agua Fria River, we shared our love of merlot, gazed upon the Milky Way from the “Sky Theater” (the rooftop of the music center) and talked about cosmology. I supported his bookstore gigs over the years, in Flagstaff by playing songs as a prelude to his show, and more recently when he came to Portland, Oregon, to read from Envisioning Sustainability at In Other Words, an independent and radical bookstore now featured and spoofed in the television series Portlandia. He was a flawlessly articulate, responsive improviser, and one of the original stand-up comedians to brandish the political and cultural realities we face. I once sent out an invitation to a bookstore gig, describing his work and adding “He’s really funny!” thinking it would increase the draw. “So you think I’m funny?” he asked, feigning terseness. That was not his focus, but part of his natural charm and demeanor. I visited Peter and Judy for the first time in 1987, when Soleri’s work brought me to San Francisco, and I got my first experience of their Noe Valley neighborhood, where I learned to look for and appreciate the life that bursts forth out of cracks in the sidewalk. During our car trip to Twin Peaks, a standard “orientation” for their guests, they showed me how it’s done: we were a small pack of urban bioneers collecting firewood for the kitchen stove from trash heaps, and gleaning fruit along the way. I have been humbled by their example and sacrifice, and inspired by their lives as artists ever after. Peter displayed his selflessness many times over the years, like when he asked for our support of Planet Drum while he focused on healing this year. Even when I tried to send him something for himself last winter, he sent a thank you note saying he’d used the gift to take Judi out for an evening in recognition of her tireless care. “Judy is my hospital,” he said, and it lifted his spirits to be able to do so. Peter’s work continues on in mine, as I prepare the final version of my master’s thesis “Re-Visioning Human Ecology: Theory and Practice” and in the sources at hand, even if they do not mention his name. In Bringing the Biosphere Home: Learning to Perceive Global Environmental Change (2002) Mitchell Thomashow dedicated chapter four to “A Place-Based Perceptual Ecology” and describes why he thinks a sense of place lies at the core of so many environmental initiatives: it conveys a sense of rootedness and stability and, he writes, “a place-based orientation . . . lends a certain tangibility to otherwise complex environmental issues.” Peter knew this, worked it, and inspired others from our movement (whose work does appear in Thomashow’s bibliography) to carry it on. And it was just part of Peter’s genius. To me, Peter was an alchemist for the work of our time — with a philosopher’s stone and a mystical poet’s heart. I’d hoped to have a conversation with him right about now, as I finish up the thesis . . . one of many unfulfilled hopes out there, I’m sure. What I do have in hand is the last postcard he sent, a Thomas Y. Wang painting called “Umbilical Cord of the Milky Way” (an incredibly colorful and complex work) which now seems emblematic to me. I cherish the memories of his lessons and of his friendship, and look now from my spot under the apricot tree to the vibrant cracks of my driveway: lobelia, viola . . . I first met Peter Berg at NABC in Excelsior Springs.MO. At the time I was very conscious of the lack of air time women got in large meetings. Connie Grand had pieced together a large beautiful Turtle Island Quilt. I suggested that men have to quilt before they could speak in the plenary session. He’d said his credo was “Live hard die young”. Was I saying I wished him dead? Possibly. I passed the test of our friendship? Maybe. This man in death like no other man I knew? I began washing the dishes after dinner. No! He shouted, No! No! Stop being so Good. Like a brother or a sister or a daughter. Peter could irritate me in my very being. The laughter he set free, his dreams of the earth. Once I took Peter to meet Gregory Bateson. Could count on some LSD from the other. Drunk, Billy blew his brains out without a word. Even though I’m a good man, I failed our pact. Will I bury Peter with my bare hands? Among humans he is due? Probably not. And make of him a song like no other. The struggle to accept the reality of Peter’s demise and even to hint at what his life and work meant to me has been that kind of hard. In 1970, as a young activist, I was already witnessing the radical import of ecology being leached out of environmentalism. The environmental movement was becoming instrumental, managerial, and centralist, distancing itself from the counterculture and comporting itself as though late industrial civilization could and should continue its trajectory, but in a lite clean cosmopolitan fashion. Power relations between Homo sapiens and other living creatures, between researchers and the laity, bioregions and nation-states, consumers and subsistence peoples, and other structural issues weren’t up for discussion downtown. Vexed, I began work on a manuscript titled Whatever Happened to Ecology? Shortly thereafter, I discovered that what had happened to ecology was Bioregionalism. It was a more fitting response to the planet’s ecosocial crises than lobbying the Feds to ensure that things got worse less quickly. Planet Drum was the vehicle for my introduction to bioregionalism and Peter Berg was the driver who welcomed me aboard. Early on, Peter’s genius and ultra hipness overawed me. He didn’t let my trepidation skew a respectful collaboration that grew into genuine friendship. Over the years I spoke at some of Planet Drum’s conferences, contributed occasionally to Raise the Stakes, and, thanks to Peter’s initiative, co-guest edited a Bioregions issue of CoEvolution Quarterly (No. 32, Winter 1981). It was an education. Bioregionalism—the congresses, the worldview, the practices and rhetoric changed my life and shaped my own writing, speaking and teaching. Bioregionalism makes such good sense that it now, if under many other names, has the quality of obviousness. But it had to be thought up and Peter Berg, never content merely to theorize, was a leading theorist. “Visionary” is an overworked term, but Peter was that, and intellectually rigorous, too. He articulated his ideas with a poet’s care and an organizer’s discipline. Which is why, along with its paramount biocentrism, Peter’s opus is durable goods. “Who am I? Where am I? and What am I going to do about it?” was the bioregional activist’s catechism The fundamental requirements of sustainability were: “Restore natural systems, satisfy basic human needs, and develop support for individuals.” Carve those in living rock. Utterly devoted to his purpose, persistent in his work, Peter Berg was nevertheless a rare ecological activist being devoid of piety or Puritanism. More pagan, he was viscerally attuned to biogeography and natural history—the peregrines, the yerba buena, the serpentine, the fogs, and the seismicity of Shasta bioregion. With like intensity, he savored journeys and art, food and drink, writing and teaching, and his family’s life. Peter was geopolitically aware and astute, but expended little intellectual energy on breaking news. He was sharply aware of the severity of the ecological crisis, but didn’t found his rhetoric on disaster. His work focused on our being one species-kind, inhabiting diverse bioregions, capable, through our cultures, of life-enhancing participation in the planet’s ecology. Once when I was batting about some apocalyptic ideas for an upcoming talk, he said, “Don’t start by opening a can of worms.” Ever the bioregional organizer, he knew not to begin by appalling your listeners and diminishing hope. Wonderful to say, after I moved from San Francisco to Leelanau County, Michigan, my friendship with Peter and Judy persisted and deepened through correspondence, phone calls, and, when I visited the Bay Area, stays at their home. The folder holding decades of postcards, letters, and dispatches from Peter is a trove of quick perceptions and deep reflections. In addition to the travel vignettes, wide-ranging wit, and enthusiastic bulletins about Planet Drum’s programs, Peter’s letters also brought kindly concern and real understanding. He could be gallant! When I last visited in late March of 2011 Peter and Judy came to the airport motel to pick me up. Peter, physically diminished, but dashing in his fine black beret, emerged from their Prius with a Douglas iris to bestow, a flower from the his cherished and highly significant sidewalk native plants garden. The timbre of Peter’s voice was always fine. During that last visit, Peter talked and talked, more compellingly than ever. Now the voice was hoarse. He needed an oxygen lanyard most of the time. Nevertheless on that last visit, in the course of a classic Berg and Goldhaft outing to meet some wildness in San Francisco, we whirled up to the saddle of the Twin Peaks. The sight of the Pacific sundown wind currying the lush newly reinstated native grasses on a hillside called forth plenty of voice for Peter’s wonder and joy. For the loss to the bioregionalist community and the world of this brilliant guide; and for the loss of such a dear friend, I grieve–but I doubt that Peter would long countenance the inconsolability. Peter Berg changed my life around. I was having my difficulties working in this environmental education field and didn’t know what to do exactly. Then I met Peter and his wife Judy at a Deep Ecology retreat at a place called Chenoa. Peter gave a speech on Bioregionalism. He blew me away. To me he was like a homeboy from my hometown (Decoto Ca.) telling it like it is. His words moved me. So After his speech, I went over to him and I introduced myself. It was a funny event. I told him, “That was heavy man can I talk with you?” It was then he replied “Hey did I say something wrong to offend you” I must have been pretty intense to get a reply like that. It was a great beginning. The three of us grabbed our swim trunks and went to the Navarro river to cool off. Along the way we stopped off at a nice garden and had discussions on ecology and bioregionalism. I told them my life story. I had never been so relaxed talking to strangers. That was one of the greatest days of my life. I took his course on Bioregional mapping. It became the great tool I use in teaching people about nature and ecology. Over the years I would go to his lectures when I could, and even stop by unannounced at the Planet Drum headquarters to say hello. Peter preferred that I call in advance, but I never did. but it was OK. I even introduced him to some of my homeboys. He got a kick out of them. And then there’s the habitat restoration projects I got to help him with in San Francisco. That was always good stuff. He was a great man to me. He’s even honorary Chicano. I wish I would have gone with him to Ecuador. I will miss him. Todas las personas en el camino encontramos algo que nos hace pensar de forma distinta, de repente conoces a alguien que fortalece mas tu vocación de protección a nuestro entorno, gracias a Pedro por haberme dado la oportunidad de enseñar bio regionalismo por 5 años en La Eco ciudad, Bahía de Caraquez, que al pasar estos años, los frutos son tan buenos,que lo percibiste cuando hablabas con Raisa, Roberto, Lissette, Stefanie, Carlos, y toda una generación de jóvenes que siguen trabajando a favor del medio ambiente con una mentalidad diferente y que participaron en este proceso, que continuara gracias a sus enseñanzas, donde seguiremos compartiendo todas las experiencias con una nueva generación de jóvenes enfocados en proteger nuestras bioregiones. [Translation: “On the road of life everyone encounters something that causes us to think differently. You suddenly meet someone who strengthens your calling to protect our environment. Thanks, Peter, for having given me the opportunity to teach bioregionalism for five years in the Eco City, Bahía de Caraquez. As these years passed, the fruits were so rich. You understood it when you were talking to Raisa, Roberto, Lissette, Stefanie, Charles and that whole generation of young people who will continue working for the environment with a different attitude, and who will participate in the process. That will continue thanks to your teachings, and we will follow in your footsteps sharing all of these experiences with a newer generation of young people focused on protecting our bioregions.” Ramon Cedeño] Translation by Joseph Johnston. It’s taken me a long time to come to words. – my first ever plenary with Caroline Estes facilitating and Peter “assisting” – both humourous and helpful in ways I’d never seen before. – a bit of instruction from Peter on reading my poetry at the NABC III coffee house. – a tour of the Mission wall murals after a long day of a really boring accounting workshop. – wandering downtown San Francisco with Peter and Judy and Judith Plant during Gay Pride weekend. He always made me laugh . . . I always saw something fresh . . .
And the learning wasn’t always easy. When my father died, after much soul searching and discussion, my aunt and I found reflections of him in all our relations (literally this time). It makes me wonder where and when we’ll each meet Peter now. Look in the mirror and laugh! In 1990 I got inspired to organize a 1-day workshop called “Reinhabiting the Wild Onion Bioregion” (or something along those lines). I called the Planet Drum office to order materials to distribute at the event and was amazed that Peter himself answered the phone. He was equally amazed that an unknown yoga teacher from Chicago was putting so much energy into bioregional organizing in an urban area. I became increasingly drawn into the vortex of the bioregional community, eventually meeting Peter in in 1991 at the congress in Kerrville, Texas. Over the years our sporadic contact was characterized by warmth and mutual appreciation. At one point (1995), however, we got embroiled in a serious conflict. We were named co-coordinators of what was ultimately a failed attempt to create a continental bioregional clearinghouse. Misunderstandings and mistrust poisoned our communication. Months later, Gene Marshall deftly facilitated a session in which we cleared the air and took each other´s hand in a gesture of reconciliation. I am grateful to have had this up-close encounter with from the many-faceted, ever-astonishing Peter Berg. He went on, in the decades since, to write some important books (most recently, Envisioning Sustainability), found the Greencities movement, edit with his wife and partner extradinaire Judith Goldhalf Raise the Stakes, and run an Eco-Ecuador project that is transforming a local city. But when I think of Peter, I think of quieter moments, one in particular in his and Judith’s San Francisco apartment where I stayed about a decade ago when in the city for a conference I didn’t actually end up attending. “You look different,” Peter said when I walked in. Judith nodded at me, and added, “He notices things like that.” I felt different, having been through some pertinent changes in my life involving crossing over from years of giving birth and nursing babies to what came next, and I was thrilled someone noticed. And Peter was the kind of person who, while writing and speaking to all kinds of theory and practice to transform the world at large, tended to notice small nuances that often eluded others. He and Judith lived in an apartment of a building they owned and used every which way to support bioregional activism, drawing in interns, writing grants, editing publications, speaking and traveling on a whim whenever there was cause. Let the light shift. Full moon and a single glaring searchbeam fades out-of-center in the silver night sky. Walking through shimmering woods without a flashlight. The circle of the possible fills with soft diffuse luminosity. The World’s electric-relay box empties into a small part of that circle. Our miraculous genetic heritage, the amazing cultures which have preceded, each human being alive now — all are connected in a species identity which has barely been explored. And it is only part of the life-identity which carries through all the other species and to the planet itself. We are relocating ourselves from world-nation to planet-region, joining the biosphere by participating in local ecosystems with all the species in them. We are accepting our human species identity. Yes, Peter, you didn’t play it for the big time or small time, but for real time, and for the real time of my life too. Thank you. I would like to add to the great surge of energy from all the messages speaking about Peter’s life and legacy, from all of you wondrous beings, voiced and quiet, who met Peter, were changed by the encounter, and who are in this circle to remember him well. He came to Toronto to celebrate with us back in the early 90s when we organized the first bioregional gathering here, Our Own Backyard. We felt so lucky, so blessed to have him here. I remember how kind he was, how playful, how grumpy and lusty. Through Peter and Judy, we felt connected to deep mythic roots in San Francisco that were just books and songs on the radio before that. He made green city ideas into flesh and blood, he lived large, he walked and danced the words into flesh and poetry. He beat the drum, and he did the work on the ground, where ever he went. Thank you Peter, thank you Planet Drum! I just wrote to Judy that I believe I met Peter first when I was fifteen. My best friend Hilda and I went up to the Haight Ashbury over Easter Week of 1967, with some slight prevarications to our parents about checking out UC Berkeley as a possible college destination, had a fabulous week and I interviewed the Diggers for our High School underground newspaper, the Uni High Worrier. As I think about it now, the Diggers had an enormous impact on my thinking and kind of shaped my view of the world, ever since! Peter was an incredibly creative, out-of-the-box thinker who made a huge contribution to the world. He’ll be much missed! After NABC [North American Bioregional Congress] II in Traverse City , Michigan (1986 ), Bruce Hinkforth and I came back to Milwaukee and, sometime in the next year, called a meeting on bioregionalism. Only two people came. After the spring Chippewa spearfishing season and boat landing Witness in 1988, we put out a call to form Milwaukee Greens, and 50 people showed up. So we went with that formation for our bioregional advocacy work. That work for the next 12 years was immeasurably indebted to all we learned from our NABC/TIBC attendance, including the wonderful Green Cities conference in Chicago where Peter Berg was one of the keynote speakers. Howie Friedman put together the July 1989 Green Cities Conference at Loyola University in Chicago where Peter Berg and Jimmy Boggs led off with keynote addresses. In his opening, Peter started out with a story of animals as a magical presence in cities. He argued that cities themselves were a threat to the planet because of the resources they pulled in and the garbage they put out. To answer the challenge of how can we contribute to life systems in the city, he offered these considerations for guiding discussions at the conference: 40% of land in cities goes to accommodating autos; No city has a system to re-use greywater; Retrofitting just city buildings with renewable energy could cut energy costs by one-fourth; There has to be a new urban consciousness for dwelling on the planet—urban dwellers are the new pioneers. Milwaukee Area Greens (MAG) announced ourselves publicly at the water quality visit of Greenpeace’s ship, the Beluga, in July 1988. We channeled those first 50 people into action task forces on issues of Urban Green Spaces, Water Quality and Toxins; Recycling and Solid Waste; Ozone Layer/CFCs; and the mayor’s upcoming appointment of director of the Department of City Development. Later came support work for light rail in the city (eventually defeated by talk radio and Republicans). The Local Currency model and other neighborhood solution projects of the E.F. Schumacher Society were too small in scale for Left Greens to support, but given what the financial meltdowns have shown in concern for families and cities, I wished we’d done more on those. MAG helped to build the statewide network in support of Chippewa treaty rights and a statewide Green group. Those treaties that protected hunting, fishing, and gathering rights were also an extra legal protection against timbering and mining in rural/wilderness areas. Over the following decade, Milwaukee Area Greens study groups included “A Green City Program for San Francisco…,” ecofeminist readings (especially Judith Plant’s Healing the Wounds: The Promise of Eco-Feminism) and Starhawk videos; Lappé and Schurman’s Taking Population Seriously; Paul Hawken’s The Ecology of Commerce; Kirk Sale’s Human Scale, and more. We tried to keep all ideological difference debates within the study groups, follow through with practical work and strategies from the theory, and build outward from our internal business meetings and in our public organizing. I have VHS tape of the Chicago “Green Cities” conference keynotes. ( If Planet Drum doesn’t have a similar record of this, I’d be glad to donate it.) On the tape, Peter then chairs a workshop of bioregion reports from different cities. Quite unfortunately, the tape goes blank there and all one can do is fast- forward and see the rapid images, but no voices, of various workshops, plenary, and closing talking circle. It’s like a long dream sequence where one feels the argument is coherent without recovering the actual content. I know the political level was high just by who I see: Grace and Jimmy Boggs, and Shea Howell (all of Detroit Summer), Roberto Mendoza (Muscogee, Oklahoma); Sam Grant (Twin Cities); Ellen Smith and Don Wescher (both MAG); Margo Adair (San Fran) and Starhawk knitting… I think there was reference to about 100 people attending, drawing activists also from Chicago, Madison (WI), Oklahoma City, and elsewhere. Our sincere condolences go out to Judy and Ocean. I wish to remember and honor Peter for his many decades of influential work and inspiration, and to thank everyone at Planet Drum who continues to carry the spirit and message. Today, bioregionalism is also strongly reflected in Milwaukee by the following organizations: Milwaukee Riverkeeper, The Park People, Wild Ones (natural landscaping), and of course, Will Allen’s Growing Power local food revolution, headquartered here. Also sprouting in some Wisconsin cities, according to Bruce Hinkforth, still with the Greens as chair of WI Greens, have been the Scandinavian eco-cities model of Natural Step (eg., Ashland, WI) and the Transition Towns model (eg., “Sustain Jefferson”). Regional high-speed rail was recently killed by Gov. Scott Walker, along with Milwaukee jobs to build those rail cars. It has been published (Saturday, 13 August 2011) at the most important newspaper published in Barcelona, both in Catalan and in Spanish. see the web edition here: http://enmemoria.lavanguardia.com/obituarios/peter-berg.html When available I will send you the .pdf file with the complete page published at La Vanguardia. Peter agreed to perform at our Distinguished Speaker Series at the Geoscience department at San Francisco State. He was, not surprisingly, warmly received, but you could sense among some of the faculty a feeling that he wasn’t part of the house crowd because he hadn’t worked inside the institution that grants PhD’s. After his presentation we went to lunch, Peter said, “Matt, I’m so happy that I’ve never had to buy into this system in order to accomplish my work.” Peter, you will always remain a role model to me, and even though I have wandered into that “system”, at least I had the insight to expose your genius to it. Peter was the most complicated, creative, challenging, genius individual I have ever known. His vision, his analysis, his insight remained pure from the first moment I made his acquaintance until his passing four decades later. Peter personifies the type of person who — after word has come that they have passed away — I always regret not having taken the time to seek out in life. Fortunately, this time, I have no such regrets. The world of the future owes much to the life he and Judy forged together.